Weighty Matters: Is pretending food's not junk worse than serving junk food? Is pretending food's not junk worse than serving junk food? A few days ago I did an interview with CTV NewsChannel on Edmonton schools' "junk food ban", a "ban" enacted with the explicit purpose of helping combat childhood obesity. I think the producer was a touch surprised during our pre-interview when I explained to her that not only hasn't Edmonton banned junk food, but they've gone and done worse, they've used nutritionism and health haloing to pretend the junk food they're still selling is in fact healthy. Instead of regular potato chips, they're selling baked potato chips. Instead of high calorie candy, they're selling bags of dried apple slices. Instead of sugared soda and energy drinks, they're selling juice and chocolate milk. Oh, and they're calling bags of pulverized vegetable pulp, combined with pulverized rice and potato flour (vegetable chips), vegetables. Hey School Boards! Listen up! 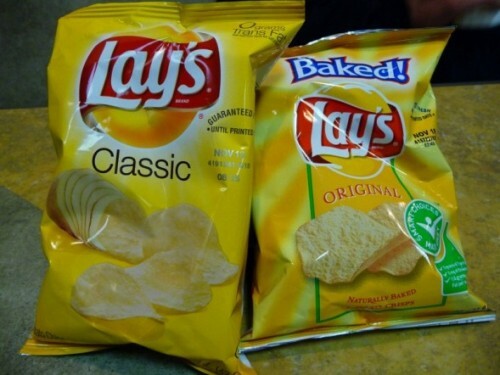 Baked chips are still potato chips, they've just got marginally fewer calories and fat grams. Bags of apple slices? Sure they were once apples. In fact they were once 4 apples - with each bag containing all 4 apples' calories - 18% more than a Snickers bar, along with over 15 teaspoons of sugar. Juice? Drop per drop it has the same number of calories and same amount of sugar as soda. Chocolate milk? Double the calories and 20% more sugar. Baking doesn't make chips healthy! Dried fruit, while certainly a yummy choice, is just fibre with highly concentrated sugar! Juice and chocolate milk? Don't get me started. And vegetable chips as vegetables? Ugh. Worse still, despite trotting out the banner of childhood obesity, there are no caloric guidelines to the school food reforms, and they still allow for extremely high levels of sodium, which in turn is often used in making highly processed junky food taste good, and consequently home cooking, comparatively bland. So at the end of the day, what Edmonton (and Ontario, and virtually all Canadian school boards) are doing is still selling junk food, but now they're labeling it as "healthy". They're also contributing to the de-healthy-palate-ification of our children, and making parenting more difficult, even for parents who do say, "No", because now parents like me who actually take the time to teach kids about true evidence based nutrition, have a very real authority figure in schools telling our kids that what we've taught them about juice, chocolate milk, baked chips, pizza and ice cream days, is wrong. There's a world of difference between slightly less awful and good, and yet here they're serving at best (and that's a huge stretch) slightly less awful food, and telling kids and parents and society that it's good for you. We're a very long, long way away from healthy schools. If this had been rolled out as a small step towards a much more comprehensive long term reform, maybe I could clap. Given that it's being rolled out as health food, it makes me wonder whether the schools would be better off selling absolute garbage - because at least then they wouldn't be undermining parents like me because they couldn't get away with pretending it was healthy. Oh, and one side argument. Some folks have said that given kids can just walk across the street and buy junk, that the schools should too. I'm pretty sure they can buy cigarettes across the street - doesn't mean schools should sell them. Schools should be safe, healthy, exemplary places, because you're damn right, pretty much everywhere else is horrifying. My two lines in the sand? 1. Schools shouldn't be serving or selling foods that their teachers teach their students not to eat. 2. Schools shouldn't be selling junk food and calling it healthy.